Though the Dallas Cowboys preseason opener yielded the first win of 2017, it was not all sunshine and roses for their offensive or defensive units. Upfront, the Cowboys are the most heralded team in the entire league. Boasting All-Pro players like Travis Frederick, Zack Martin, and Tyron Smith, it has been basically assumed that Dallas has the league's top offensive line since 2014. And, while those three are great and I don't have many questions about the week one starters, Thursday night proved that the depth behind those starters may be an issue. "Jumbo" Joe Looney, as NBC announcer Cris Collinsworth likes to call him, had quite possibly his worst performance in over a calendar year. Used as the sixth offensive linemen in 2016, Looney got a ton of in-game reps in the team's jumbo sets. Those reps did not seem to help Thursday night, however, as he was pushed into the backfield on run plays far too often. On one particular play, Looney didn't even give running back Darren McFadden a chance to make a cut, resulting in a loss of yardage. Starting left tackle Emmett Cleary had a somewhat rough night as well, though he did look to be a solid depth player during the week 17 showdown with Philadelphia a season ago. Filling in for right tackle La'el Smith, Kadeem Edwards didn't even stand a chance on some snaps, getting run right by and ending up on the ground. Byron Bell had his moments, as did Jonathan Cooper, which speaks to why those two are now competing for the starting left guard spot. Rookies Dan Skipper and Nate Theaker also had their moments, and I look forward to seeing more from them. A common issue among this second unit upfront is their lack of balance. When working with double teams, working laterally, and moving up to the second level as you must do in a zone blocking scheme, offensive linemen must stay on their feet. It is an absolute necessity, as one linemen hitting the deck could ruin the entirety of the run play. The Cowboys second unit struggled mightily with this, bringing into question if some of them are really able to play in the Dallas scheme. Of course, it is still very early in the preseason. Things will work themselves out as the weeks go by and more games are played. 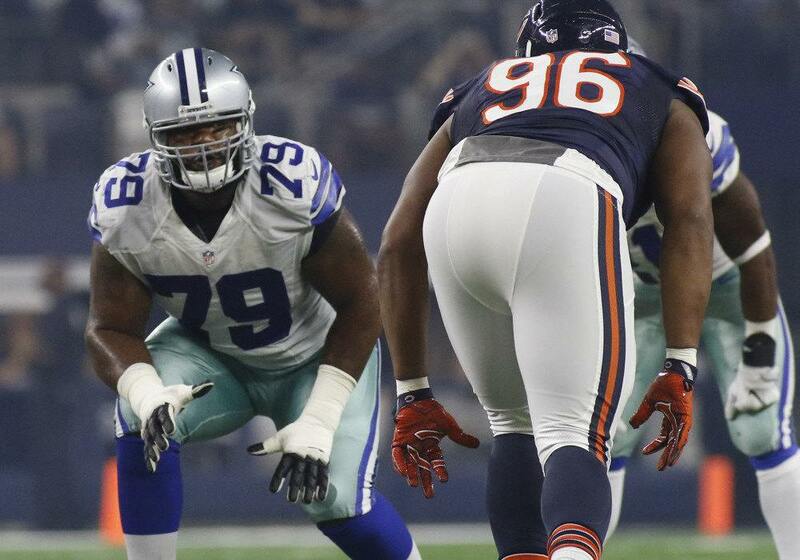 But with Tyron Smith's back issues, I think there is some reason for concern about the Cowboys' offensive line depth. It is important to remember that third year lineman Chaz Green is still yet to return from injury. In my book, Green is the best remaining offensive linemen not named Frederick, Martin, Collins, or Smith. Once Green returns, the depth behind the starting line is bound to look at least a bit better.